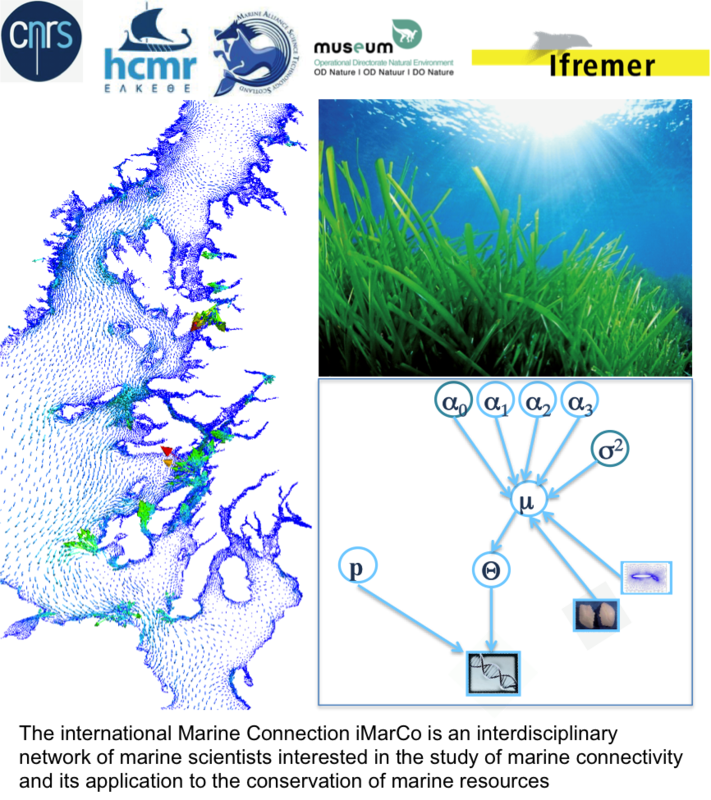 iMarCo is a new initiative aimed at creating an international network for promoting collaborative projects among European scientists interested in the study of marine connectivity. The network covers a broad spectrum of marine science disciplines including physical oceanography, microchemistry, genetics and evolutionary ecology, behaviour, tagging, fisheries and aquaculture. The strategic objective of iMarCo is to organise and create synergies among the European scientific community sharing an interest in the understanding of the spatial dynamics of marine populations. Fostering innovative research and establishment of collaborative structures to develop joint projects and apply to research funding calls for proposals (e.g. EU FP2020). Synthesis and dissemination of knowledge on oceanographic, genetic, and microchemistry methods for the study of connectivity. Multidisciplinary training of young researchers by promoting scientific communication and geographic and thematic connectivity between different teams. Organization of workshops and thematic schools (or Master modules) to achieve the necessary synthesis and advanced training of young researchers. Promotion and dissemination of methods and results among managers of Marine Protected Areas and Natural Resource Agencies. During the kick-off meeting of iMarCo that took place in Montpellier last year it was decided to hold the first official meeting of the network in Scotland. This meeting will take place at the University of Saint Andrews in June 2016 and one of the organisers is Oscar Gaggiotti, a member of the Methods in Ecology and Evolution Associate Editor Board. It will start in the afternoon of Monday 27 June and will finish at noon on Wednesday 29 June. There will be a total of four sessions and one of them will be devoted to demographic connectivity aspects of Marine Protected Areas. Would you need Bed & Breakfast accommodation at the University? Would you stay in St Andrews for the whole duration of the meeting? If possible, please let us know your planned arrival and departure dates. Would you be interested in giving a talk? If so, please send a tentative title. Please reply by February 23nd so that we can pre-book accommodations with the university conference and group service. A preliminary programme will be published in early April. This entry was posted in Meetings and tagged Aquaculture, Demographic Connectivity, Electronic Tagging, evolutionary ecology, Fisheries, genetics, iMarCo, International Marine Connectivity, Marine Connectivity, Marine Protected Areas, Microchemistry, Natural Resource Agencies, Physical Oceanography by Chris Grieves. Bookmark the permalink.